The Lincoln Lollipop Experiment was conducted by Delilah Aguirre, Corey Sedam, Kaylee Navarro, and Mason Wales. 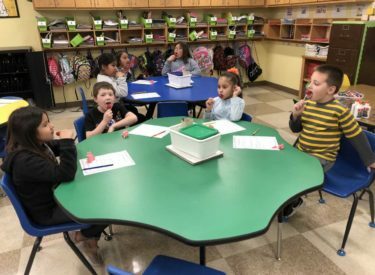 They were to see if they could get to the center of the lollipop in 100 licks, to celebrate 100 days of school. How many licks does it take to get to the center of a lollipop? These Lincon Elementary School students gave it their best effort on Thursday. We’re not sure who got to the center first, but they’re all winners!